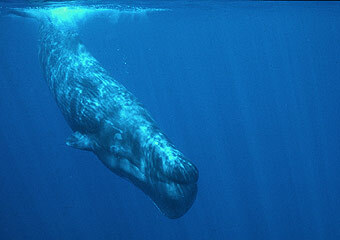 A Sperm whale - the primary focus of the Ocean Alliance's five-year global study. Read a preliminary report on some of the scientific results of the Voyage so far. This is Captain Iain Kerr reporting from the helm of the Ocean Alliance lab in Lincoln, Massachusetts. After a five-week passage from the Maldives, the Odyssey arrived in the Mediterranean Sea and the Port of Marmaris, Turkey. As we prepare for our first research leg in the Mediterranean, the crew is taking time to reflect on the incredible journey and achievements of the Voyage in the Indian Ocean - the third largest ocean in the world - where as unbelievable as it may seem - cetacean research is a rarity. 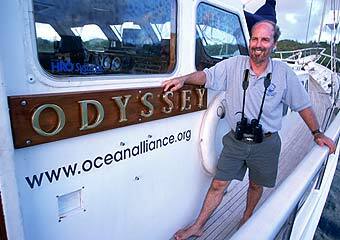 On August 18, 2001, the Odyssey crew arrived in Darwin, Australia and two and a half years of research and adventure in the Indian Ocean began. For me at least, more so than almost any other ocean in the world the Indian Ocean is a place shrouded in the mystique of ancient trade routes and lost civilizations, captivating in its range of cultures, unique wildlife and spectacular underwater environments. Pirates of the Arabian Sea (still there), the Spice routes, Madagascar, Aldabra, Sri Lanka & the Chagos Archipelago are still fertile grounds for the imagination. As soon as we arrived in the Indian Ocean we realized that this was likely to be one of the most interesting and productive study sites of the Voyage. The Indian Ocean covers 26,000,000 square miles (67,450,000 square kilometers) and after 2 and a half years we have only just begun to understand the perilous nature of its bounties and are sorry to be moving on, leaving much of its mysterious aquatic realm unknown and unexplored... To Quote the Governor of California - "well be back!!!" I have often talked of our fundamental skill set being that the Odyssey and crew can spend extended periods of time offshore in remote ocean regions with little or no shore support Ð In the Indian Ocean we lived up to this claim like never before. There are at least 19 species of cetacean in the Indian Ocean and the opportunities for discovery are rife. The Voyage of the Odyssey represents the first comprehensive marine mammal study in the Indian Ocean since the Indian Ocean sanctuary was declared in 1979. While successful, our research in this area where cetacean populations, morphology and abundance is poorly understood, has highlighted the need for more research (and funding) in the region. The most rewarding part of the Indian Ocean program for me was how enthusiastically we were supported by the island nations with whom we worked and consequently shared our findings. When we left many sighted the work of the Ocean Alliance as a reason for them to continue supporting the Indian Ocean whale sanctuary. Captain Iain Kerr tirelessly co-ordinates the expedition from land and at sea. The Odyssey crew found sperm whales in every region of research, including the remote south west coast of Australia where this species has not been sighted since the cessation of commercial whaling in the late 1970's. We were the first group to conduct cetacean research around the Chagos Archipelago in the central Indian Ocean and the remote uninhabited Aldabran islands 600 miles west of the capitol of the Seychelles. We tracked an enormous bull sperm whale through a 1 hour and fifty-seven minute dive in Mauritius, the longest known recording of an entire dive cycle, and documented and identified possible sperm whale breeding grounds in the granitic Seychelles. In total we collected over 400 sperm whale tissue samples from all corners of the tropical Indian Ocean. The results will give us an indication of the distribution and effects of manmade toxicants on marine life in the Indian Ocean. "While there are a few reports on contaminant levels in sperm whales from Australia and South Africa, there is currently NO information on pollutant loads in animals from other parts of the Indian Ocean and NO information on the effects these chemicals may have on the health of this species and that of other marine animals. The samples collected during our cruises are therefore very valuable scientifically. In addition to the Indian Ocean being closed at the northern end, several locations in the Indian Ocean may be affected by pollutants being transported by water currents or through atmospheric transfers from hot spots such as those present in parts of Asia or India. The numerous samples collected in many different areas within the Indian Ocean may help identify 'oceanic hot spots'." We sighted a diverse range of cetacean species throughout the tropical and sub-tropical Indian Ocean. We observed blue whales feeding among sperm whales and Bryde's whales off the Basses in Sri Lanka, a male humpback whale sang a mournful courtship song that reverberated beneath our keel off Desroches Island in the Seychelles, while a sociable humpback mother and calf pair joined us 500 miles from land for an unforgettable four hour jaunt on route from the Seychelles to the Maldives. Among the fifteen smaller cetacean sightings was the rarely seen Longman's beaked whale. We watched killer whales forage on bottlenose dolphins in the Maldives, Risso's dolphins mate beneath the bow in Sri Lanka, pilot whales apparently harrassing sperm whales off Albany, and schools of thousands of spotted and spinner dolphins off the coast of Somalia. We have made a significant contribution to what is currently known about the range of small cetacean species throughout the Indian Ocean, including rough-toothed, Fraser's, striped and Risso's dolphins, psuedo-orcas, melon headed whales, pygmy killer whales, pilot whales and dwarf sperm whales. Hand in hand with the science program, education is always at the forefront of our mission. Another first for the Ocean Alliance is the unique education and media outreach program conducted from onboard Odyssey. Odyssey is also a teaching ship, a platform that enables the crew to share the experience of the Voyage and raise awareness (especially in remote oceanic island nations) about the importance of a healthy marine environment. The Odyssey crew spoke with thousands of school children from the remote inland regions of Australia, to the ancient, culturally exotic island of Sri Lanka. We took part in a marine education festival in Seychelles and were presented with pictures and petitions dedicated to the protection of whales and their marine ecosystem from school children in Mauritius. We opened the boat to government officials, local and international media, university students and the general public in every port Ð literally thousands of people stepped aboard Odyssey to learn about our global pollution study. Those who did not meet the crew in person had the opportunity to link live from the classroom and talk with researchers in the field or access our website. The Odyssey crew posted 187 stories about the Voyage in the Indian Ocean Ð a website that is followed by school children all over the world and used as a marine education resource by teachers. 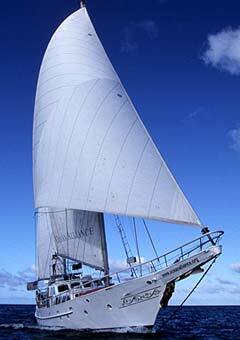 On May 19, 2004, the Odyssey crew concluded their research in the Indian Ocean and traveled up the Suez Canal. We have spent over one thousand days Indian Ocean, researching in international waters and the Exclusive Economic Zones (EEZ) of six countries covering over 37,000 nautical miles. We crossed the equator nine times with a rotation of 52 crewmembers, visiting scientists and observers from all over the world. In addition to our sperm whale tissue samples, we collected fish and squid samples along with thousands of hours of marine mammal acoustic recordings and collected video footage and images of hundreds of animals - a contribution to the understanding of cetaceans in the Indian Ocean that will be harvested for years to come. The Odyssey crew spent over 1000 days in the Indian Ocean covering more than 37,000 nautical miles in their search for sperm whales. "Fundamentally, the message we heard boiled down to this: the oceans and coasts are in trouble and we need to change the way we manage them." Cited as key aspects to national ocean policy framework were the need for "current, credible, unbiased scientific data" and "high quality education" about the oceans. The research that we have carried out and results of our research findings will provide "current, credible, unbiased scientific data" that will support more research and better laws and regulations to preserve our ocean ecosystems and protect the health of human and non-human species. "This is not the end. This is not the beginning of the end. This is the end of the beginning." Read a preliminary report on some of the scientific results of the Voyage of the Odyssey so far. Two years ago in the Indian Ocean? Log written by Captain Iain Kerr with Genevieve Johnson.